The Diamond Jubillee Sub-Committee: Chairman Paul Temple (centre) Jean-Maree Christenson, Brian Paatsch with Sue Zimmer and Louise Peacock (insert). In the exhibition wall windows in High St, Wodonga (Outside Coles Supermarket) Paul Temple and his helpers Brian, Melinda and Jean-Maree have set up informative displays from the club's six decades. Former 1990-91 President Jim Roelofs with his image titled 'Murray River at Wodonga'. The exhibition ran from 6th through to the 3rd March 2013 at the Creators Artspace on the Causeway. (Both current and old members were invited to participated in this exhibition). A big thank you for those who helped Paul and Rob hang the photos and setup the Exhibition. Congratulations to the organizing committee (Paul Temple and Rob Grant) for a very successful exhibition with over 400+ visitors attending, while it was open. Especially when it wasn't able to be manned for 22 hours so the numbers couldn't be taken during that period. Congratulations to Mark and Rob for selling their photos. A big thank you for the members that gave up their time to man the exhibition, in particular Melinda Marengo and John and Denise Organ who all contributed over 20 hours. Inspirational and amazing photos - Rachel Anderson - Wodonga. Awesome! - Ella Martin - Albury. A stunning exhibition, thank you all - Paula Carter - Oxford, UK. Beautiful - Jenny King - Tallangatta. Fantastic photos - Wendy and Chris Bensen - Lavington. Story touching photos - Fraziska Kurka - Vienna, Austria. Talented Photographers - John and Helen - Wodonga. Very interesting (My father, Jack Tanner was a member in the late 50s and 60s) - Jan Baynes - West Wodonga. 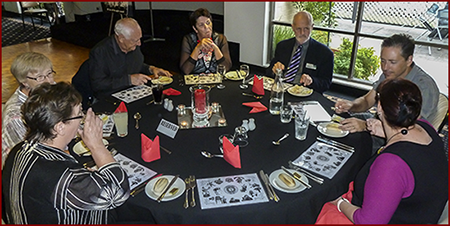 The Diamond Jubilee Dinner was a very enjoyable evening, a three course meal beautifully catered for by the Panthers staff. Our invited guest included: David and Sue Thurley (Albury City), Penny Graham (CEO) also Brian Charmers (Board Chairman) Panthers Club), Justin Dallinger (Foto Supplies), Kerry and Leighton Weymouth (Website Hosting). Past Presidents, Life Members, and of course our members. Our entertainment was provided by young Lavington entertainer Zac Barrenechea who performed three songs, much to the delight of the room. A slide show of 100 years of History in photographs concluded the function. A big thank you to those past and present members and invited guest who accepted invitations. The Jubilee Workshop with Brian Basham on 'Creative Portraiture and Off Camera Flash' at the Panthers on Saturday the 23rd of February, was a great success. Brian gave us an inspiring presentation and left us with food for thought. It told us we have got a lot more to learn and perfect in this aspect of photography. We all need to go out and put into practise, now that we have the guidelines to use. Perhaps we might have a portraiture competition in the new programme for next season starting in July. View the programme. 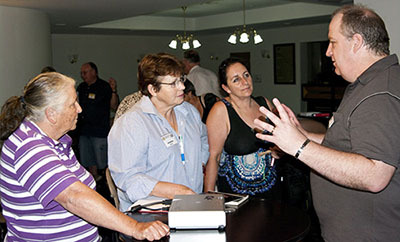 Monica, Sharon and Jean-Maree recieve advice from Brian Basham during the Workshop. Left: Photos of Jim Roelofs, his wife and Jack Dallinger during a club outing in 1989. (Photos courtesy of John Copeland).